Somerset County Council are nolonger able to fund the routine maintenance of its historic fingerposts. They invited Parish Councils and community groups to do the maintenance - they fund the mandatory training, but the cost of materials is funded by the PCs/groups. Early 2018 High Ham Parish Council decided to get involved and fund the restoration project to ensure the parish's 6 historic fingerpost's future. 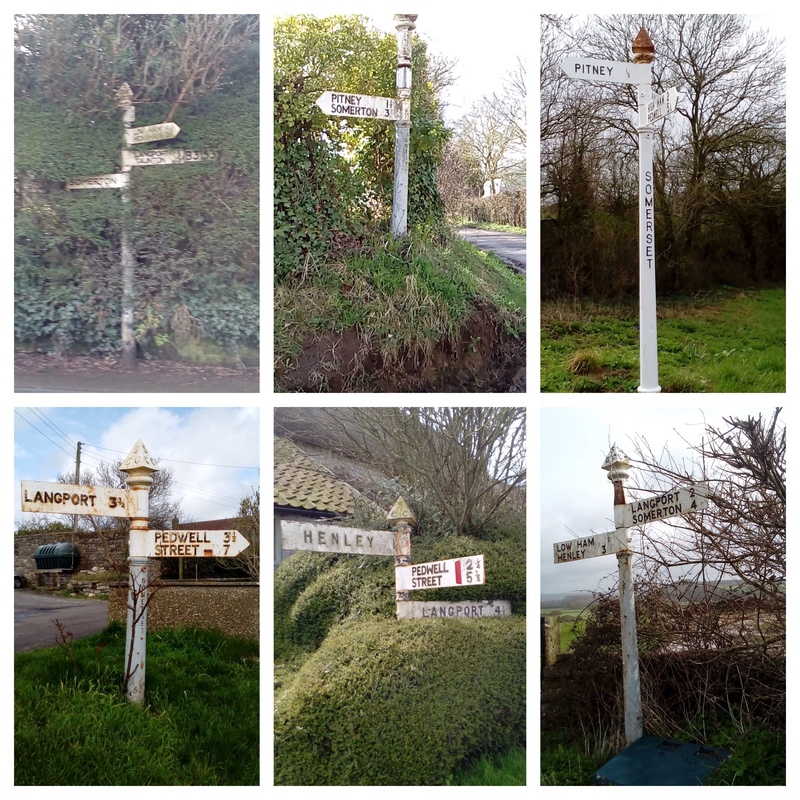 Following a day of training and a lot of form filling, a survey of all the parish's fingerposts was completed with photographs, measurements and condition reports and submitted to SCC. All paints used during restoration are regulation SSDC Highways paints. The 3 newer fingerposts will be cleaned, but painting will be minimal. The signpost on Picts Hill cannot be restored by the volunteers because of its precarious location. January 2019 After many year’s absence, the 3rd finger has been returned to the fingerpost located at the top of Hext Hill. Thanks to Roger Powell for the welding and painting, and for Phil Cale’s assistance. 02.11.18. Restoration of the fingerpost at the top of Ham Hill, opposite Maisey’s, is now finished. Thanks to all the passers-by who paused to chat, particularly to Martin Gray who entertained and thanked us! Thanks to all the team who worked on this and the other 3 restored posts: Roger, Amanda, Dave and Phil. 2 fingerposts left to do. 09.10.18 Work started on the post opposite Maisey’s with removing rust and priming. The collar, removed from the Hext Hill post for repairs, enabled the reinstatement of the long-missing finger (Pedwell/Street) that has spent the last few years in the pub. Work paused when the team helped recover a stray sheep from the small flock being moved to a field along Fountain. Thanks to Marion and Dennis for the use of their electricity. The team (Roger, Dave, Phil and Amanda) will continue work on the post on 16th. 05.06.18 Fingerpost at top of Hext Hill - lettering painted. Post at Windsor Farm, Henley - post excavated and raised in height. Post and arm still in situ, scraped and primed. Post at bottom of Stout excavated in preparation for removal. Deep down, fragments of decorated early C20th china found, with lego brick underneath - curious archaeological layers! Thanks to Bill who briefly joined in, to nearby resident's crowbar, and to passing drivers' words of thanks. Workparty: Roger P, Dave V, Phil C, Amanda C.
30.05.18 Wearne and West Henley signs - algae removed. One Elm post raised lettering 'Somerset' painted black. Hext Hill finial reinstated and final coats of post and arms finished. Henley/Ham Hill junction the finial and 2 of the 3 arms removed with the use of jemmies, jacks and a lot of effort - they will have rust and layers of flaking paint removed, and primer and top coats painted off-site. 4 hour session. when cutting back hedge to access the post, a water hydrant post and drain access cover were revealed. Thanks to Jane at Windsor Farm for refreshments and broom. Workparty: Roger P, Dave V, Phil C, Amanda C.
22.05.18 One Elm fingerpost finished with finial painted following removal of rust, priming and top-coating. Hext Hill fingerpost first coat on post and arms.